New data suggest that while fewer California sea lions are showing up at Bonneville Dam and eating fewer spring salmon than just a few years ago, the number of Steller sea lions could be increasing, and along with them, the volume of salmon they eat. Data also show over the last several years that sea lions -- mostly Stellers -- are increasingly showing up in the fall to prey on that fish run. Experts say these two factors mean there's a chance the sea lion removal program, which includes trapping and killing animals, could be expanded to new species and seasons. Every year, thousands of spring Chinook salmon fight the currents to return to the Columbia River basin. But over the last decade hungry sea lions have posed one final threat to the fish as they slow to navigate around Bonneville Dam, about 40 miles up river from Portland. For years the states of Washington, Oregon and Idaho have trapped and killed selected California sea lions at Bonneville in an effort to protect the threatened fish runs. State wildlife managers could face a new problem if Stellers are, indeed, supplanting California sea lions at Bonneville. That's because Stellers remain protected with no authorization available to kill or trap them. So far this year, the states have killed 15 California sea lions. Since the removal program began in 2008, about 70 California sea lions have been either euthanized or trapped and sent to new homes like Sea World and the Queens Zoo. It's a controversial practice, subject to litigation between fish managers, tribes and animal rights groups. But state and federal managers agree sea lions continue to pose a significant threat to the federally mandated salmon recovery programs. In 2002, biologists with the U.S. Army Corps of Engineers began collecting information on the handful of California sea lions that started appearing at Bonneville Dam about 150 miles from the Pacific Ocean. "It was a novelty," said Garth Griffin, a National Oceanic and Atmospheric Administration fisheries biologist. "We went from the Corps reporting an animal or two, literally, to in 2002 maybe five, and by 2004, 2005, there were 100." The dam creates a pinch point, slowing the salmon and making a plentiful buffet for male California sea lions looking to bulk up before heading off to breed at rookeries to the south. California sea lions were -- and still are -- eating thousands of salmon right in front of the dam, said Robin Brown, program leader for marine mammal research and management at the Oregon Department of Fish and Wildlife. The Corps' "estimate of whatever's being taken is a very, very minimal estimate of the total loss," Brown said, noting they only measure what the sea lions eat within a quarter mile of the dam. "We operate in the river, 5 to 10 miles below the dam and we see fish, salmon and steelhead, killed by sea lions everywhere." Research by NOAA shows in 2013, almost one-third of the spring salmon run didn't make it from the mouth of the Columbia River to Bonneville Dam. Michelle Rub, a NOAA research biologist, suspects sea lions are responsible. "It's mostly circumstantial right now," Rub said. "What else could it be? We haven't identified other sources of mortality that we think would be significant." When the Marine Mammal Protection Act went into effect in 1972, the California sea lion population was struggling to hang on at around 10,000 after decades of being hunted and sometimes killed for sport or target practice. Today, biologists say the population has recovered to more than 300,000. "The Marine Mammal Protection Act did it's job," NOAA's Griffin said. But at Bonneville Dam, protection for sea lions has run directly into conflict with decades of Columbia River salmon recovery efforts -- programs that have cost taxpayers hundreds of millions of dollars. "Everything you can imagine has been tackled in one way or another to try and recover these fish, which are not doing very well," Oregon's Brown said, adding that each one of the many actions designed to help salmon benefit anywhere from one-half to two percent of the run. "If any other party -- a water user, a land user, the hydropower system, anybody else -- all of the sudden said 'Oh, by the way. Next year we're going to kill an extra five percent of the run,' it would never be allowed," he said. "All hell would break loose." And according to Brown, that's exactly what the sea lions are doing. 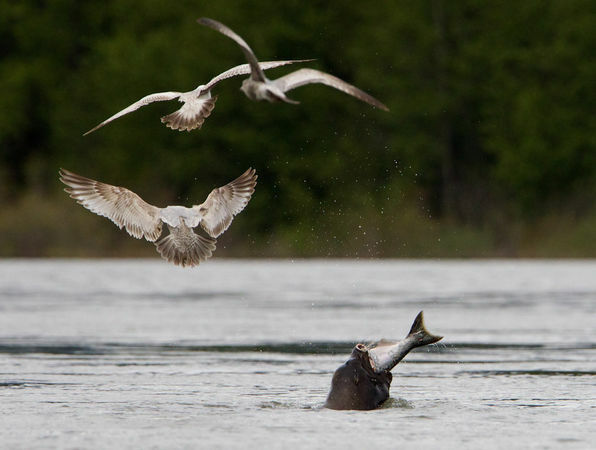 The situation that's developed below Bonneville Dam isn't the first time humans have tried to defend fish runs from sea lions. In 1994, Congress amended the Mammal Protection Act in response to a unique situation at Ballard Locks in Seattle, along a strip of water that connects Lake Washington to Puget Sound. For years, a group of California sea lions preyed on a winter steelhead run as the fish became trapped against Ballard Locks. So Section 120 was added to the act, creating a way for states to euthanize sea lions that eat threatened fish runs. "It was a way to take those really strict protections afforded all marine mammals and then it went down and basically provided this one little off ramp just for pinnipeds -- so these are seals and sea lions -- that are eating endangered and at risk salmon," NOAA's Griffin said. In 2006, Washington, Idaho and Oregon filed for an exemption to the Marine Mammal Protection Act under Section 120. Two years later the plan was approved and the states began trapping and killing California sea lions at Bonneville Dam. In March 2008, the Humane Society of the United States filed a lawsuit in Oregon District Court to stop the program. The case wound its way to the 9th Circuit Court of Appeals, which ruled in favor of the government in September 2013. Sharon Young, the Humane Society's marine issues field director, says that euthanizing California sea lions is a distraction from the larger issues and challenges facing the overall recovery of salmon, such as pollution and habitat restoration in the river. "Animals are being killed for no purpose," Young said. "If you want to save salmon, realistically you have to do the things that are going to make a difference to the rate of recovery." She said that young salmon are competing with, and being eaten by, non-native fish, which, she said, the state manages to keep in the river. "If you are sincere in saying 'we've got to care about these fish (salmon) then you have to take the actions that are going to mean something,'" Young said. "This program is not about recovery. It's doing a disservice by distracting attention from the fact that the actual things that could make a difference are not being addressed." Preliminary data for this spring show fewer Steller sea lions showed up this year compared to in years past. Still, biologists are mindful that Steller sea lions -- for which there is no removal program -- kill a significant number of fish. As of May 28, sea lions had killed nearly 2,400 Chinook salmon at Bonneville Dam, according to preliminary data from the Army Corps of Engineers. About 62 percent were killed by California sea lions, the rest by Stellers sea lions. Last year, the data show that California and Steller sea lions killed nearly the same number of salmon. In 2012, Stellers killed even more salmon than their California cousins. "I don't think they've (Stellers) reached that point where they've taken enough salmon that would cause the alarm that it did with California's -- yet," said Robert Stansell, a fish biologist with the Corps at Bonneville. "That may change after this year." One complicating factor is that over the last three years a growing number of mostly Steller sea lions are returning to the dam in the fall. While it's no where near what's been observed during the spring, the number of sea lions and fish kills are increasing, Stansell said. One factor to watch this year is how the record salmon run that's predicted for the fall -- some 1.6 million fall Chinook -- might change the number of sea lions showing up at the dam. Meanwhile, biologists with the state and federal government are hesitant to say whether the spring program aimed at removing California sea lions is working. According to data from the Corps of Engineers, the number of salmon killed by sea lions is below its peak of more than 6300 in 2010, but so is the number of spring salmon that have passed through Bonneville Dam. The sea lion removal program is authorized to run through 2016, when biologists plan to review its effectiveness.